I have often sat down with a paper and pen and pondered on creating a new recipe. Up till now I did this with cooking. Up till now! Last week I actually faced my apprehensions face on and composed a new cake, dessert, call it whatever you wish. Here a tart, there a tart, every where I blog I see a tart! It seems like the hottest trend this blog season is the "Tart", ladies and gentlemen. In every form and shape they are presented with scrumptious fillings. I have also been a fashion victim and posted my Tart Ratatouille recently. For this recipe I was inspired by two lovely ladies. L, of Cookbook 411 who had the great idea of making tarts in mini muffin tins. The Queen of Tarts, however, is Bea of La Tartine Gourmande. Nothing compares to her tarts. With these two as my inspirations I sat down to create my ultimate tart. 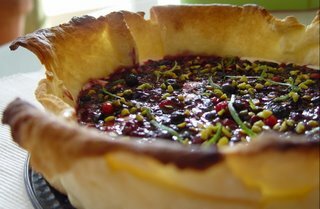 Line a cake tin with the dough and bake in a pre-heated oven according to instructions. Don't be too neat with this. Just overlap the dough or make one side higher than the other. The unevenness gives it a more rustical look and makes a good looking tart! In the meantime whisk the vanilla essence, cinnamon powder and 1/2 teaspoon of ground ginger into the mascarpone. Set aside. Take the cake tin out of the oven when ready and allow to cool. Melt the sugar in a pan gently caramelizing it. Add the berries and coat with the caramel. 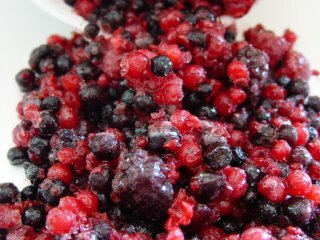 If using frozen berries you will notice that the caramel gets hard, but then once allowed to simmer melts into the liquid. Add the cinnamon stick, 1/2 teaspoon ground ginger and the lime juice. Simmer for a few minutes. The frozen berries will leave a lot of liquid, so the best thing is to put into a sieve to drain the liquid. The liquid can be used for a drink or milkshakes. Spread the mascarpone mixture on the dough. Now, spread the berry mixture over the top. Sprinkle with chopped pistachio nuts and the lemon zest. Verdict: I made this over the weekend. My in-laws were coming over and I decided to use them as my test people. Is it a good sign when the whole cake disappeared? There was nothing left. Everyone said it was delicious. The composition of the ginger, cinnamon with the berries and mascarpone was just perfect. I find this such a versatile type of dish as it can also be served as a dessert. I was just happy that it not only look good but tasted delish. If you do try this out, please do let me know how it turned out! Glad I could help inspire such a beautiful dish! I love the pistachios grated on the top. They add a gorgeous color, and I bet they were delicious. Nice to have you here! Between you and Bea I really had the best inspiration a girl could get to create something like this. It was fantastic. What a gorgeous presentation! I love how you were able to get the crust so high. It's lovely. Nice of you to stop by. I used a normal cake tin and as I had loads of dough just lined it as far as it would go. It did make a good effect! I am so envious of you living in Italy. I LOVE Italy and everything Italian.